We are sometimes asked “Can a switch be fitted to swap between standard hand control and radio control?” This page explains how. 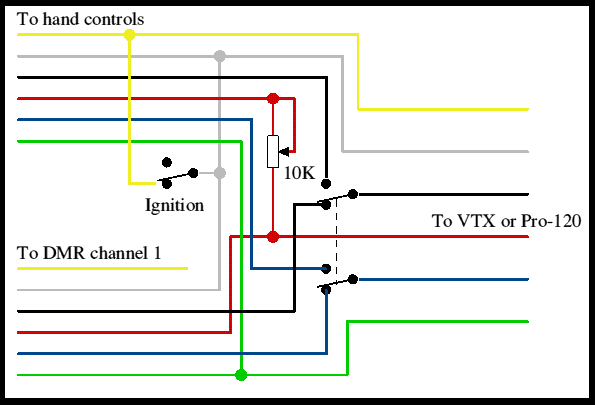 The page details the DNO / VTX and Pro-120 but the same system can be used with other controllers. The easiest way, wiring wise, is clearly to unplug the hand control and plug in the DMR, but that requires the controllers gain control to be adjusted. If a switch is required, a two pole switch should be used. Blue: pot wiper. Must be switched. Red. +8.5v to pot. Or supply to DMR. This should not generally need switching as the DMR takes little current. Black. Reverse. Must be switched. Yellow: +battery feed. Does not need to be connected to DR. It is only fed there for wiring convenience and only connects to the DMR’s ignition connector. Note that with this arrangement as described the speed under radio control will be around half that under pot control. If this is undesirable, a variable resistor (10K is suggested) should be fitted in the red lead to the hand control speed potentiometer as shown in the diagram, to reduce the output from the speed pot. This can also be fitted in the hand control if a plug and socket is used. Set the controller gain control to maximum as instructed in the DMR instructions. Switch to hand control pot and adjust the new 10K resistor so that full pot rotation just gives full controller speed.